Ah…summer. It’s not exactly the season that illicits images of preheating the oven to 350 or eating fattening foods, but I’ve never been one to go with the flow. I love my sugar and I love my oven–even if both make my life hell during these warmer months. That’s why I try to be more efficient, bake goodies that require less time in the oven than others. And that’s where these cookies come in. Butter pecan ice cream is probably one of my favorite flavors. I love how it’s creamy, nutty, sweet, and salty all at once–a perfect balance summer needs, like ice cold A/C and 90 degree heat. So when I came across a recipe for butter pecan cookies, how could I resist? Especially since the recipe was practically vegan to begin with and I had all the ingredients handy. I have to admit, I had a hard time not just eating the dough. Personally, I think the dough ought to be frozen into little balls and thrown into vanilla ice cream to make butter pecan cookie dough ice cream–it’d be sinfully amazing! But, for the sake of the blog, I did follow through with the baking part of the recipe. And am I glad I did. These cookies are buttery and sugary and salty and crunchy and soft all at once. They make no pretensions of being good for me and I can’t not eat them. It wouldn’t be fair to their perfectness and the delicious things in life. Preheat oven to 350°. On a baking sheet, toast pecans until fragrant, about 6 minutes. Let cool completely; finely chop. With an electric mixer, cream butter for about a minute. Add 1/3 cup sugar and cream until light, about 1 minute more. Beat in vanilla, salt, and flour, scraping down sides of bowl, just until dough comes together. Fold in pecans. Form the dough into small equal-sized balls, place on cookie sheet, and flatten gently with your palm. Bake until golden brown, 10-12 minutes. Those look great! I love butter pecan. Even in the ATL heat is brutal. sweet gloriousness! Jes – i love you!!!! butter pecan ice cream is also one of my favorites (so is maple pecan) – i’ve gotta make these cookies when i’m done with ACT. perhaps i’ll attempt to make them gluten free as i have a friend who’d g.f and is a pecan lover as well! damn, these look so gooooood! yes. raw cookie dough. all the time. that’s why being vegan is awesome. this recipe sounds great. ooh those sound great! I love a cookie recipe that doesn’t call for egg replacer. This is such an easy recipe and the cookies turned out so good! It’s hot here too and I try to do my baking in the mornings while it’s still a little bearable. This recipe seems so simple and sounds divine, Jes – I’m going to give it a try the next time I need a cookie fix, which will likely come on soon after seeing that photo! I have no qualms about turning on the oven on a hot summer day. Thanks for the vegan version, Meghan. I have a friend who would appreciate that. !! you are such a cookie genius! cookies shouldn’t always be so good for you, I think. sometimes they need to be sin-delivery devices. 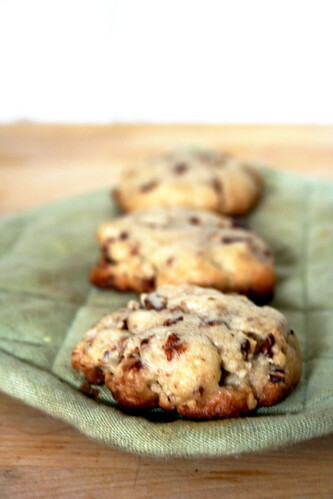 and I’ve never made a buttery pecan cookie! I’ll have to bookmark this!